Recently, our library has been studying ways to improve the quality of our instant messaging reference service. While we’re thrilled the popularity of IM reference has continued to grow (according to our data, the number of questions we answered nearly quintupled during the two year period from 2008-2010! ), increasing popularity can also lead to not-so-fun growing pains. Once such instance is when, typically during evenings or weekends, our reference services are single-staffed. Juggling multiple in-person and virtual reference interactions can make it difficult for one person to provide prompt service, leading to frustrations from librarians and students alike. As we have been looking for ways to alleviate such situations, I was happy to see LibraryH3lp debut their new Frequently Asked Questions (long-time readers might remember we discussed using LibraryH3lp to address previous IM conundrums). Although I’ve see other examples of FAQ’s on various libraries’ websites, LibraryH3lp makes it easy to create a searchable (and mobile friendly!) FAQ site you can build to supplement other reference service resources. Building the FAQ site is relatively straightforward. LibraryH3lp users can start right away using the “FAQ” tab in their admin site. First, check out the “Questions” tab where you can add questions and answers. You can also assign each question to any number of topics, which will then be browse-able on your live FAQ site. You can also visit the “Questions” tab after your page is set up to view usage statistics like the number of views and likes or dislikes per question. For more specific details about setting up and configuring your own FAQ module, see the LibraryH3lp documentation. And check out Library H3lp’s own FAQ page for an example. We’re hoping that sending our chat users a quick “Hello, we’ll be right with you!” message along link to a more in-depth, searchable FAQ page while they are waiting for further assistance will help improve the responsiveness of our IM reference services. While this certainly does not provide the same depth and level of service their eventual chat with librarian will, it is quick and simple to set up and could be a good resource for users who have a commonly asked question or just need to be pointed to some quick facts about the library. We’re just starting to get our FAQ page set-up, and I will provide updates to this post as we progress and finalize our page. In the mean time, does your library have a similar FAQ resource you’ve found successful? We’d love to see it! I love the idea of Creative Commons works. The idea that a creator can set his or her own parameters on what is “fair” use is incredibly powerful. Policing image usage in a digital age can be quite hairy, however. Copy and paste, drag and drop, and “save image as” are all quick and easy ways to grab digital images from the web. Even those of us with the best of intentions for attributing our images often have a hard time keeping the proper documentation connected with the correct images. As an academic librarian, I really want to set a good example for my students by citing all of my images correctly, but I don’t want to have to juggle image files, CC licenses, and links to creators separately. That’s where Image Codr comes in. 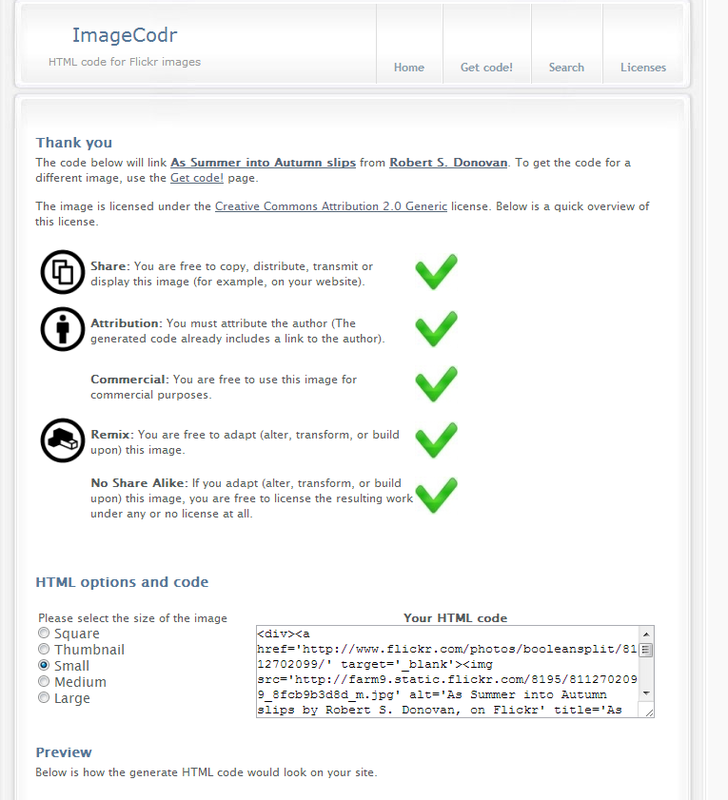 As Image Codr says on its website, there are a number of steps involved in properly citing a CC image on a website. The result is a webpage that clearly tells you the parameters of the CC license and gives you a chunk of code to copy into your webpage with all the proper links and attributions. I love this site because it takes the guess work out of citing CC images, which I feel is the one complicating factor of CC in general. This site gives a correct, consistent way to cite images on your website without having to do any hand coding. There is also the option to drag a bookmark from the “Get code” page into your browser’s toolbar, so you don’t even have to go to the Image Codr website once you’ve found an image you like. As for finding CC images on Flickr, you can certainly use Flickr’s own interface by either browsing through their CC images or selecting to search in “The Commons” from the advanced search screen. 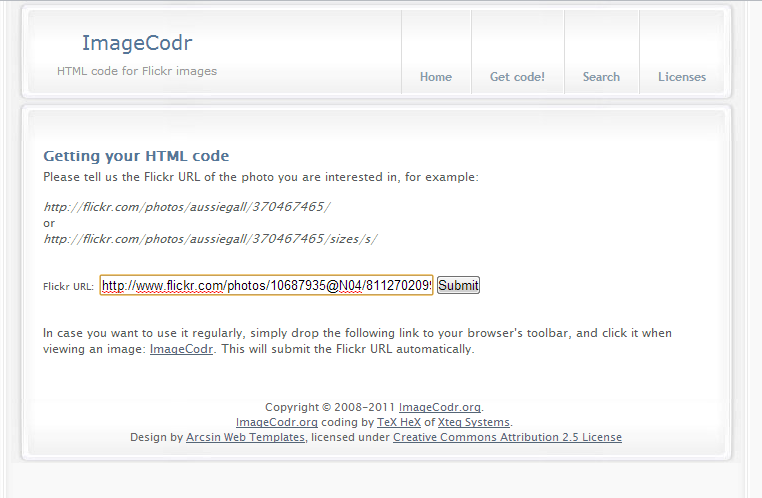 Image Codr also has a simple search interface that redirects to Flickr. 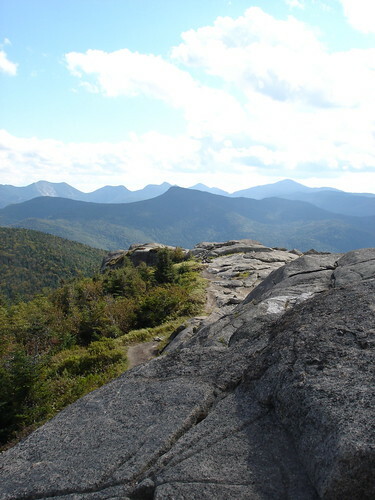 Another option, and the one that I use most frequently, is FlickrCC Blue Mountains. This is an external site that searches only Flickr CC images and redirects you to the Flickr page for grabbing the image. 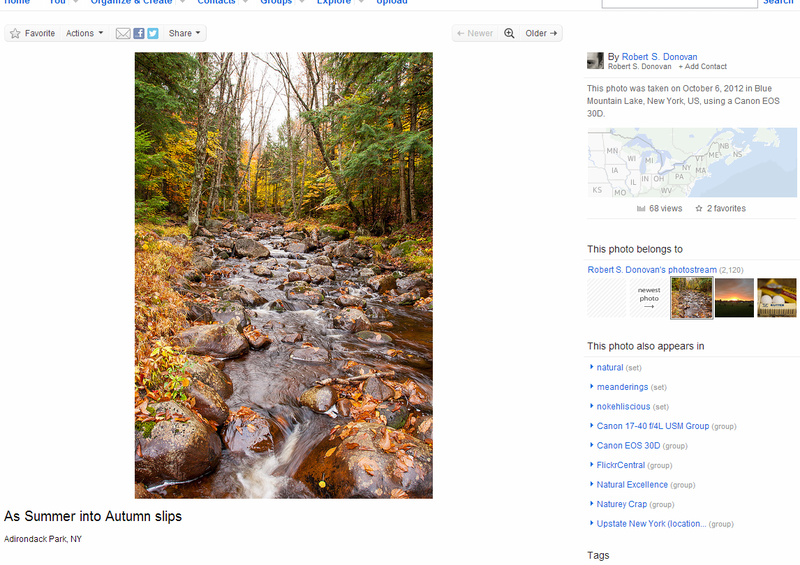 It’s a bare bones site, but I find it to be much easier to use for searching CC images than Flickr’s own site. Meggan Frost is the Public Services Librarian at Paul Smith’s College in Paul Smiths, NY. As a librarian in a small school, her job requires her to be a jack-of-all-trades, although she spends most of her time trying to create great classes and workshops. A freelancing musician in a previous life, her interests in librarianship are centered on academic libraries with an emphasis on multimedia resources. You can read more at http://librarianmeg.wordpress.com or follow her on Twitter @doubleG2718.